It is not easy if you are trying to de-clutter your home and yet the more you get rid of the more you seem to find. 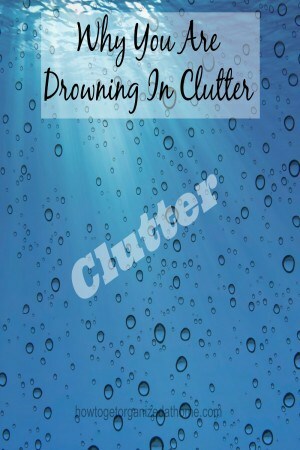 It can feel like you are drowning in clutter. Often what is happening, when you start to de-clutter you start to notice more, these areas might have always been filled with clutter but because you are living there, you don’t always notice the true extent of the clutter that builds up in your home. It is going to take time to become organized, it is not going to happen overnight, but the more you do the more clutter you can see. No matter how hard you try, if you have too much stuff you need to get rid of things to start organizing. You just can’t organize anything if there are too many items for the area or space that you have. Getting rid of things is not easy, you can get attached to objects, and they become a memory. While it might seem harsh to throw an item away that you associate with a point in your life, but if you have too many of these precious items then your home becomes full and you won’t be able to appreciate anything. Letting some things go will allow you to live in your home comfortably; after all, the memories are still stored in your head and your heart so you won’t forget them. As society changes and parents live in a world where there are more opportunities to have more things and to give more things to our children, their lives become cluttered, too. They can’t play with every toy, they don’t need every toy in existence to have a good and happy upbringing. You are also teaching your children about having more than they need, it could lead them into adulthood with a misplaced sense of need and this could lead them into a life of debt. It might seem an easy solution but in reality for many people it has become a way of life, buying the latest gadgets and finding pleasure in shopping to excess. However, if you put steps in place to stop this spending, or at least to cut it down slowly, you will notice there are less and fewer items coming into your homes where you need to find it a home. Some organized people have a system that if they buy something new, then something old has to leave the home. This is a great idea; it forces you to think about getting rid of something to make space for the new item. For me, if I need to buy something I can spend weeks thinking about it, to my family’s annoyance. If I am spending any money I want the right product and often by the time I get round to buying something new, there are items that I am willing to get rid of. Getting rid of the stuff that is cluttering up your life and your home can feel like a weight being lifting off your shoulders, you become happier and your home life is less stressful. There is also the added benefit of having less to clean if you have less clutter. Many people believe that to have the latest gadgets or every item of clothing is going to make them happy. This is not the case, possessions won’t make you feel happier, they can make you unhappy and stressed as you worry about money and paying all the bills. Therefore, if you feel like you are drowning in clutter, stop, take charge and start getting rid of the things that you no longer need or even want. Alternatively, if you are looking for a lot of resources, over 35 to help you take control of the clutter you must check out Conquer Your Clutter Super Bundle! What is your best tip to avoid drowning in clutter? Comment below! Looking for more articles on this topic? Head over to the landing page where you will find links to other articles on organizing! I think you will like this article too! 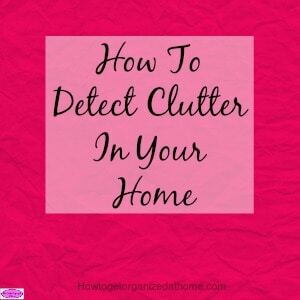 How To Detect Clutter In Your Home. I’m working on purging just as fast as I can! I declutter ruthlessly. It really makes me enjoy my stuff much more. I am tired of my clutter. I’m purging it as fast as I can. You are right, you can’t organise clutter and it really does feel better when it is gone. I recently read that Americans have 3% of the world’s children, but buy 40% of the world’s toys! I find one way to get rid of clutter is to be willing to get rid of cheap seasonal decorations. Sometimes I try to save the decorations until next year, but find they really didn’t hold up in storage. Instead, after I’ve enjoyed them a season, I’m willing to get rid of them and find something new next time. The other option is to get nice seasonal items that store well, and then only buy more when you’re ready to donate the existing decorations. I just know that sometimes I open boxes and find tattered paper flowers and bent decorations and think, “Well, this is just junk now! Why on earth did I box this up and find a place to store it? Ah, this is so true! Lately, I have been very purposeful about shopping with a purpose and only buying what we need. I used to go shopping for fun and see what I could find on the clearance shelves, but it was really just unnecessary clutter. Great encouragement! This post came at the perfect time. I need to take some time to do some major purging of some old things and this has light a fire under me. Thanks for sharing on Merry Monday.